Bourne Hall Museum is appealing for the public's help to locate and acquire artefacts, photos, etc. relating to the acclaimed cartoonist and his work. Frank Hampson came to Epsom in the early 1950s and was soon established in Bayford Lodge, which served as his home and his studio. There, for a decade, he created the cartoon strips that held the nation's schoolboys (and others!) enthralled, as they waited eagerly each week for the latest edition of Eagle to learn whether Dan Dare, the intrepid space explorer, had survived his most recent mission. An exhibition about the life of the gifted illustrator will be put on display at Bourne Hall Museum from early December until February 2019. We would like to encourage anyone in the area who has memorabilia, photographs, posters, toys or publications about the life and work of Frank Hampson to take part in this commemorative event. All items donated will be fully acknowledged and returned at the end of the exhibition. Museum curator, Jeremy Harte, said, "There is a significant amount of local interest and a number of people have already made contact with us". "Within the community there may be people who remember, for example, the staged fights with ray guns outside Bayford Lodge, as Frank Hampson gathered material for the next instalment to go up on his drawing board. If anyone has books, pictures, toys or even just reminiscences, did he teach you when you were at NESCOT, we would love to know about them." 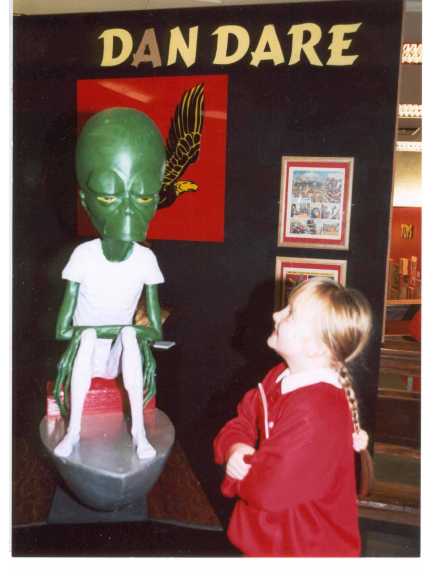 Anyone who would like to contribute to the Frank Hampson Centenary exhibition should contact David Brooks, Bourne Hall Museum, Spring Street, Ewell, KT17 1UF. Tel: 020 8394 1734 or email dbrooks@epsom-ewell.gov.uk. Life forms came from far and wide to the last Dan Dare exhibition!